Hello, and welcome back to another edition of Ultra Budget Brews, the article that builds entire EDH decks on the cheap. I believe that 46% is the highest percentage that any commander has received in one of these polls. So either you all are real excited to see Taigam, you all really didn’t want to see the others, or you all just like seeing unpopular commanders be built. I’ll admit that I’m very glad Edric didn’t win on account of my brother building him. I’ve played against that deck a lot recently, and getting your teeth kicked in by a bunch of evasive 1/1’s is way worse than it sounds. 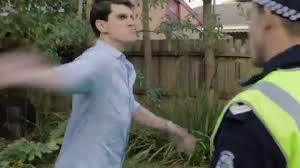 Enough about Edric. We’re here to talk about Taigam. Bojuka Bog, Rest in Peace, and friends make you a sad panda. As alluded to earlier, Taigam is pretty unpopular, leading a mere 71 decks. I think that there are a few reasons for this. Our Taigam kind of pales in comparison to Taigam, Ojutai Master. While the our Taigam may not be as generically powerful, I do think he’s a ton more interesting. I mean, we’ve all either played with or against a deck that does nothing but take extra turns, and I’m not sure exciting, original, or interesting are words that would be used to describe them. I also think part of his unpopularity can be attributed to the very first line of text. 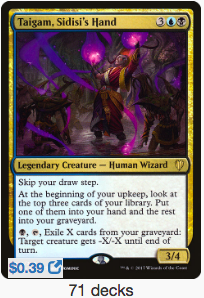 “Skip your draw step” is not a phrase that typically makes you get excited about building a commander. In fact the very first thing it makes me do is brainstorm ways to donate it to my opponents. 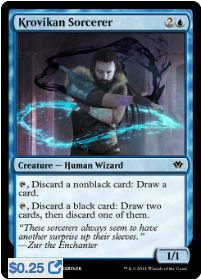 Drawing cards just so happens to be a pretty important of playing Magic. If we skip an entire phase, the tradeoff better be pretty powerful! Thankfully, it is. The ability to look at the top 3 cards of our library and choose which we want is very powerful and is something I’m more than happy tradeoff for my draw step. Thankfully, it gets even better. You throw the other cards in to your graveyard. I’m sure you don’t need to be reminded, but were playing black. 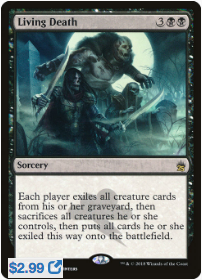 Black loves a stocked graveyard and has innumerable ways to get things back to your hand from the graveyard or to get creatures directly on to the battlefield. 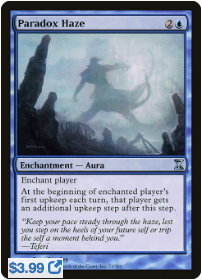 Taigam also gives us a powerful way remove opponents’ creatures. For a single black mana, you exile X cards from your graveyard and you give target critter -X/-X. There will be cards that get dumped in to your graveyard that you want nothing to do with, such as lands and some instants and sorceries. This allows you to turn these into a resource. Targeted removal is something that every deck needs. 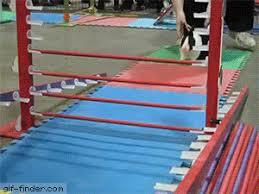 This happens to be repeatable and even gets around indestructible creatures. It’s also perfect for picking off small important utility creatures like Oracle of Mul Daya and Baral, Chief of Compliance. With all of this in mind, lets check out our deck. If you’ve followed my articles for any length of time, I’m sure you aren’t surprised, but we really leaned in to the graveyard theme. Building decks that center around your commander is my preferred style, mostly because it’s part of what makes EDH such a unique and enjoyable format to me. Taigam is great at filling our graveyard up, so it only seemed right to try and take advantage of this situation. I have some good news, and I have some bad news. The bad news is that the best graveyard recursion spells are not in our budget. 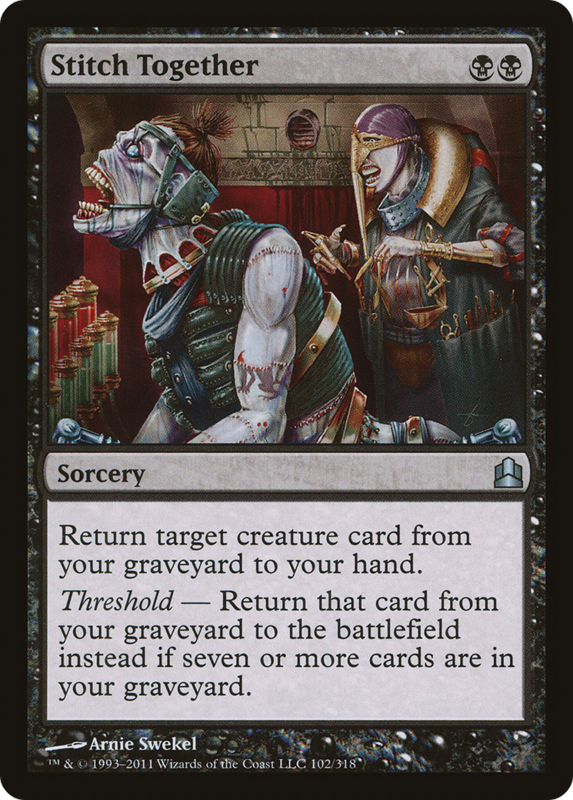 Graveyard payoff cards like Rise of the Dark Realms, Animate Dead, and Sheoldred, Whispering One are all equal parts powerful and popular, which is a perfect recipe for a card to cost more than $1, sometimes significantly so. It’s not just the payoff cards either. Even some our the graveyard enablers are a bit too spendy for us. Frantic Search, Entomb, and Geier Reach Sanitarium are all great examples of cards that any sort of graveyard focused deck would love to run, but we can’t because of our budget restrictions. Now the good news! We still have a ton of awesome options. Our deck splits up into (roughly) 3 parts: ways to fill our graveyard, ways to recur our cards, and recursion targets. Taigam is definitely one of our better ways to fill our graveyard since he allows us to be a bit more selective about what we toss, but there are a number of options. Cards like Thought Scour, Forbidden Alchemy, and Windfall are all great at this. Ancient Excavation is a bit of a pet card of mine. You get to choose which cards you want to throw away and then draw more cards, or you can cycle it away if you really need a basic land. All at instant speed no less! Tomb Robber is another great way to both fill our yard and get value for doing so. 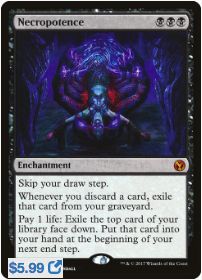 Explore is a mechanic I really enjoyed in Limited and I am excited to see how it plays out in EDH. There are a surprising number of budget ways to put creatures straight from the graveyard to the battlefield. Dread Return, Profane Command, Ever After are some of the best ways we have. Victimize is a card that I see far less often than I should. Trading one of my creatures for 2 from the graveyard can be an insane amount of value. We also have a couple of creatures that help us resurrect our beaters. Demon of Dark Schemes and Phyrexian Delver do the job admirably; the demon even allows you to get cards out of your opponents graveyard if they have a particularly enticing option. 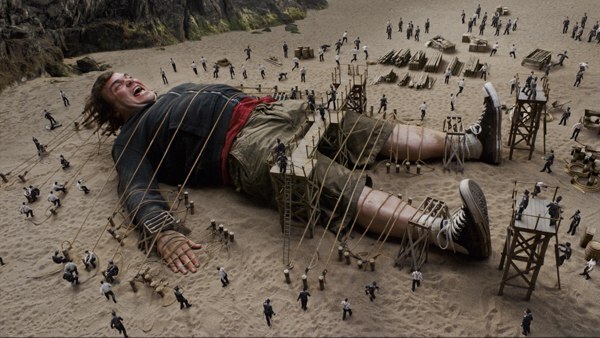 We are running quite a few big, fun creatures that we want to cheat onto the battlefield from our graveyard. 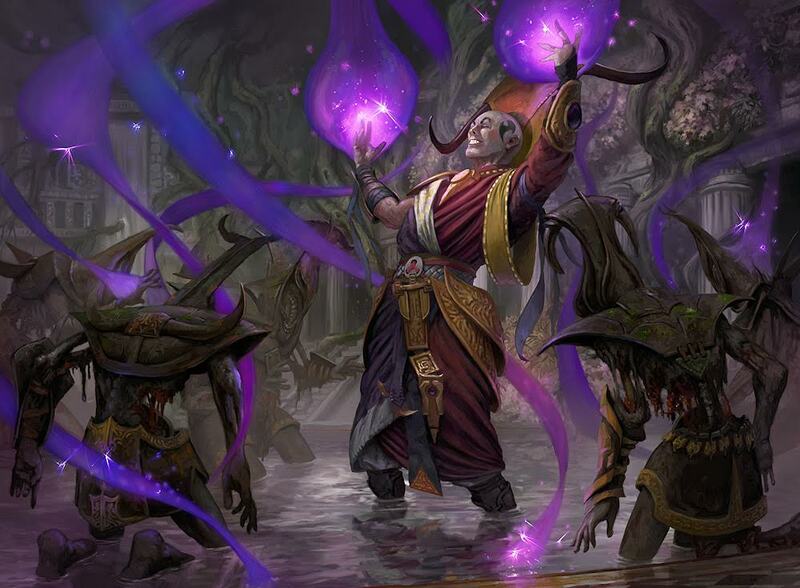 Artisan of Kozilek and Ulamog’s Crusher are our obligatory Eldrazi. We have a number of large demons to get back. Kuro, Pitlord, Xathrid Demon, and Shadowborn Demon are all cards that used to see more play than they do now, while Pestilence Demon and Archfiend of Depravity are probably more familiar cards to the average EDH player. Mindleech Mass is one of my favorite cards that never seems to find a home. It’s a perfect fit here. We also have a number of ‘value’ targets, like Fleshbag Marauder and Ravenous Chupacabra that might not be the most exciting and splashy things to recur, but can certainly help you out in a pinch. The rest of the deck are staples that every deck needs. We run a number of mana rocks to help us ramp, a few counters, some card draw, and a bit of removal. If you’ll indulge me, I’d like to quickly discuss the card Read the Bones. 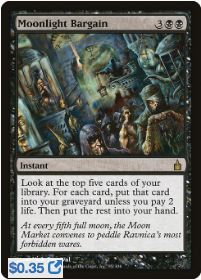 It costs 3 mana, which is the same as another very popular draw spell in black, Phyrexian Arena. Arena is in close to 4x as many decks as the Read the Bones and that seems…off. Phyrexian Arena is a fantastic card, don’t get me wrong, but it takes a few turns to get the same amount of value that you get from Read the Bones, and is removable as well. So really, I’m not saying that Arena should see less play, but that Read the Bones should see more. For 2 black mana you can return a creature to your hand from the graveyard. 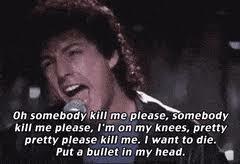 That’s fine. Nothing to write home about, but it’s serviceable. This card is on here because of the Threshold ability. When you have 7 or more cards in your yard (which should happen pretty often), you return card directly to play. For 2 mana. This card is simply great. I’m not embarrassed to admit that I had never heard of this card before I sat down to come up with a deck list for this article. Using this to get a giant uncastable monster from your hand in to your graveyard is great. Using this to dig for answers is awesome as well. Your best bet is likely the second one. Discarding a huge demon to make your graveyard bigger, draw two cards and then discard another one of those is exactly what this deck wants. It’s small, innocuous, and exactly the kind of card that is unlikely to eat spot removal. This is 100% a pet card of mine. Really, the only reason it’s any good is because it’s an instant. If it were a sorcery, I’d likely never play it. As it stands, you draw 5 cards for 5 mana, which is a great rate. For each card you keep, you pay a small amount of life, but anything you don’t want goes to the graveyard for no payment. It’s a highly underrated card that you will almost never be sad to draw. I’ve never seen this card played against me, but it seems like the kind of card that should see play. It reads a bit like a worse Animate Dead, but in reality that doesn’t tell the whole story. 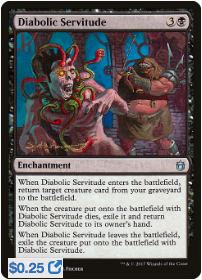 If the enchantment dies, then yes, it’s essentially worse, but if the creature dies, you get Diabolic Servitude back to your hand to animate something else. That’s a lot of potential upside. Creature removal is a lot more prevalent than enchantment removal, so I think that you’ll get this back more often than you think. This card should be terrible, and in any other deck it’s not very good. That being said, the downside of skipping our draw step is one were totally ok with since we plan on skipping it anyhow. So slap this on that blue player with the Rhystic Study or Consecrated Sphinx. 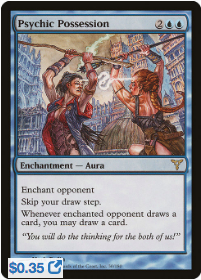 Azami, Lady of Scrolls and Edric, Spymaster of Trest got you down? Let them do all the work and draw you cards. As always, these are the cards that were cut because they were too expensive. I’d add any of these in if I was unconcerned about the budget restriction, wanted to up the power level of the deck, or just had copies sitting around in my binder. This works like gangbusters with Taigam’s ability. Doing it once is great. Doing it twice…is twice as good. Remember how we don’t care about skipping our draw step? Yep, we still don’t. There is a bit of downside with this card that you need to be careful about. Discarding cards from your hand exiles them. That being said, the ability to randomly pay 10 life to draw 10 cards at your end step is bonkers enough that I’m willing to play around the downside. The longer I look at this card, the more I like it. 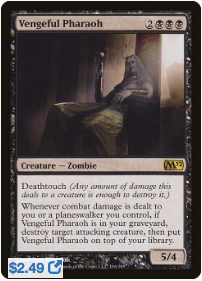 It has decent stats, a relevant keyword that encourages it to block, likely killing it, which puts it in the graveyard, which is sort of where you wanted it in the first place. As rattlesnake cards go, this is a great one. Does this get sort of screwed by tokens? Sure, but then you can draw it and use any number of ways to throw it back in the graveyard or just cast it, repeating the process Ad Nauseum. Reprints are the best. This card was twice as expensive before Masters 25. Now Masters 25 wasn’t the greatest reprint set, but there were some gems that I was very happy to see and Living Death is definitely one of those. You are likely to have a larger graveyard than your opponents, so while they might be helped a bit, you’re likely to get the largest advantage. And if you won’t, don’t cast until you do. This card simply ends games. What do you think about this deck? Is it something you would play, or did I miss the target? Any cards that should be in here that I overlooked? Let me know below! Next time, we’re going to take a look at cards from Dominaria, so I decided to do something different for this poll. The last time I did a set review (for Rivals of Ixalan), I did it like an awards show. I had a bit of fun with it, so I figured I’d get you all in on the action this time. Which of the following themes do you want to see the set review in?